Celebrating the life of John Ward Gillespie Sr.
Obituary for John Ward Gillespie Sr.
John Ward Gillespie Sr., of Roanoke, VA, long time resident of Glen Burnie, Maryland, passed away on October 21, in Knoxville, TN. 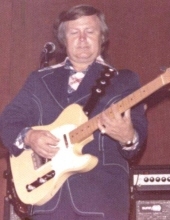 John was a self taught guitarist who traveled with Ronnie Dove for 25 years in the U.S. and Canada. He was preceded in death by his companion, Cathy Amberg, his parents, Joseph Chance & Mamie Bell Gillespie: his son, John Jr. & John’s wife, Karen Ann Gillespie, Granddaughter: Tracy Lynette Barker, Grandson: Michael Lee Barnes, Great Grandson: Jonathan Matthew Molt, six brothers: Charlie, Millard, Frank, Silas, Andy, Paul, and two sisters, Mary (Sis) Magdalene Gillespie, Ethel May Gillespie. Survivors include: sister: Ruth Maupin, Children: Brenda Joyce Collins & (Dane), Sharon Jean McLain, Carolyn Gillespie Stone, Bonita Susan Tinker, Sarah Venessa McNally, Duane Alan Kinder. Surviving grandchildren include: Terry Renee Barker, Dane Clark Collins Jr. & (Chandra), Brian Keith Huffman & (Christy), John Carlton McLain III & (Kelly), Christopher Scott McLain & (Kristy), Joshua Gillespie, John Ward Gillespie III, Michael Lee Gillespie, Gavin Tanner Gillespie, Donna Hohibein, Ricky McNally, Brittney Leann McNally. Surviving Great grandchildren: Alexander James Huffman, Ryan Cole McLain, Aaden Scott McLain, Easton Hunter McLain, Michael Anthony Barker, James Haven Ferrell, Arianna Soleil Collins. Surviving great, great grandchildren: Logan Alexander Haven Ferrell. Click Funeral Home Middlebrook Chapel is serving the Gillespie family. To send flowers or a remembrance gift to the family of John Ward Gillespie Sr., please visit our Tribute Store. "Email Address" would like to share the life celebration of John Ward Gillespie Sr.. Click on the "link" to go to share a favorite memory or leave a condolence message for the family.